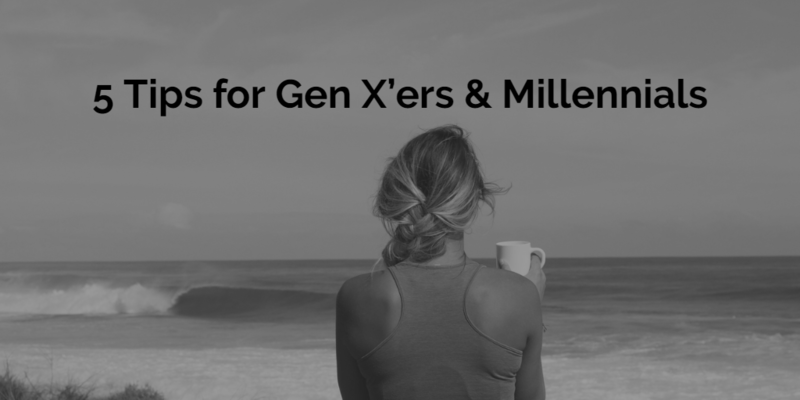 Financial Tips for Gen X’ers & Millennials. By now you probably know that I usually like to provide advice in a specific order, generally the same advice I would provide when crafting a financial plan for a client. However, today I am going to provide 5 tips and/or ideas that should provide some short-term answers and long-term guidance. There is no order to these 5 tips and some may or may not pertain to you. It always makes me giggle when a client/prospect/friend/family member says how excited they are because they just got a $4,000 tax refund. Okay, let’s call a timeout here, you essentially GAVE the federal government $300 extra dollars per month. They held on to your money until your “tax refund” and then simply gave it back to you. Oh yea, and they paid you a 0.00% interest rate. I am not a banker, but that’s not a good rate of return on a loan. And worst of all, once you got that $4,000 refund you probably wasted it on Beyoncé tickets, a nice dinner and buying all the booze for your friends prior to the concert (fail!). Many of you probably did mark a “0 or 1” years ago but have since married, bought a home and had a child or four. If you are consistently getting large refunds, adjust your W4 upwards. For example, from a 1 to a 2. The higher your number (aka exemptions) the lower your tax withholdings, the MORE money in your paycheck and the LESS money you lent to the government at a 0.00% interest rate. Now to play it safe, I recommend only going up by 1 each year to avoid any tax shockers. Meaning I don’t want you going from a refund of $4,000 to all of a sudden owing $4,000 in taxes. Baby steps will allow you to adjust each year. In a perfect world, your taxes zero out each year, no money in and no refund. That is probably too close for comfort for many, so the happy place would be a refund around $500 each year. YOUR money is more powerful today in your hands than it is a year from now. This can be a Roth 401k/403b (many more employers now offer this option) and/or your Roth IRA. Roth 101: you invest after-tax dollars into your Roth. Uncle Sam and the gang gets their cut now; however, you then get tax-deferred growth in your Roth and tax-free withdrawals in retirement. The main question you have to ask yourself is where do you think tax rates will be when you retire? Honestly, I have no darn clue where they will be but I am going to leave this little figure right here, $19 TRILLION. Correct, that is our current debt level in the USA. Taxes may not go up, but they surely are not going down. I tell my clients that in a perfect world they will have an equal balance of Roth assets and Qualified (401k, 403b, 457, etc…) assets when they retire so that we can be strategic with their withdrawals. The younger you are, the more I would nudge you towards the Roth world. Gen X & Gen Y were either a part of the past stock market collapse(s) or they watched their parents’ 401k become a 201k, and heard about it every morning at breakfast. Either way, it left a sour taste in our mouths. The good news is that based on a recent study from TD Ameritrade, it does look like Gen X & Gen Y are utilizing stock ETFs which is a great sign! Stocks sound like such a bad word, but as long as you’re not taking your dentist or brother-in-law’s advice on this “hot penny stock is the next Amazon!” you should be in good shape. Take advantage of the VTI, SPY, VOO and the QQQs of the world, and not the stocks trading at $.23 per share. Unless you are retiring at 32, you shouldn’t be touching your retirement accounts until….wait for it….retirement! Yes, I know the Roth “allows” you to use it if needed. I don’t care what your last broker told you in order to make a commission, but retirement accounts should only be used for retirement. This is why you should be using liquid accounts (savings accounts, accessible CDs, etc.…) for your other goals, like a home purchase and an emergency fund. You most likely are going to get nailed with taxes and penalties as well, especially if it’s a 401k or IRA. This is my favorite line, “but Chad I am paying myself back inside of my 401k.” Pause for a second and read that line three times and admit that it sounds stupid. Okay, I digress. Now here is why it’s a bad idea, you are now missing out on the growth and compounding interest on that “loan.” Yes, I understand you are paying yourself back which is better than paying a bank, but please take my advice here. Don’t do it! Math 101: Let’s assume your “loan” money would have been invested for 30 years and earned a 7% rate of return each year. Instead, you pulled out $20,000 for something stupid. Well, that was a $132,000 error. The $20,000 would have become $152,000 based on our scenario above. I bet that Mustang was worth it, right? You better hope it turns into a damn antique for it to be a “savvy” financial decision. I had once heard of an insurance salesman that would take the obituaries of clients under the age of 40 to their first meetings as a reminder that life happens and it happens fast. Now, I think that is a bit aggressive, but the more I work with Gen X and Gen Y I do see where he was coming from. I am also included in that, “I think I am invincible group.” Heck, it took me a full year to figure out why life insurance made sense for me at 22 years old with no wife and no kids. It took me even longer to understand why I needed disability insurance to secure my future income. Full disclosure, this was mostly because I had no income to insure when I first started this journey. Life insurance: Lock in your insurability while you are young and healthy with a cheap term policy. Your monthly premium is going to be less than your recent trip to Chipotle and Starbucks and be WAY more important down the road. Most of our clients lock in $500,000 of 20 or 30-year term life insurance for $20-$40 a month (don’t quote me on that, age and health have a major effect on your premiums). That is for a private policy, an employer plan should be even less than that (possibly much less). Let me tell you a bad time to try to get life insurance, you are now married and you just found out you are about to have your first child. You call me to help, we apply for life insurance and when we get your blood results back, something is wrong. You are now uninsurable for the rest of your life…this is very sad, but unfortunately, I have seen this occur more than once already. Disability insurance: This is even more important the younger you are because it covers more of your working years. Disability insurance is the most underutilized and misunderstood insurance out there in my opinion. Private disability policies can range in price depending on your career field, income and if you have an employer plan in place. I have clients paying less than $100 a month and clients paying more than $500 per month depending on those above factors. Hopefully, your employer offers a solid short-term and long-term disability option for you. Make sure you are taking full advantage of those. Your employer plans should be much cheaper than a private policy. However, it may be wise to add a private long-term policy on top of your current group plan to really bolster your coverage, especially as your income continues to increase. Long story short, don’t pretend you are invincible and that this stuff can’t happen to you. It can, and if you’re not prepared it can devastate your life and your family. Honestly, I hate insurance and I tell my clients that. Insurance is the one thing I want you to pay for, but I pray you never have to use it. Although if you need it, you will count your lucky stars that you had it. You always want to insure the things that would change your life overnight and a premature death or disability event would do just that. Well, I guess we will end on that happy note for this blog. These 5 tips have no specific order or bearing to any financial plan. I find myself discussing these tips from time to time with clients, friends/family, prospects and random people at bars in Philly (j/k) which is why I thought it was time to publish!